...ich nie przyjmujemy (choć jak przewiduje regulamin, jest to zadanie opcjonalne). Każdy z Was ma pomysł na sweter. 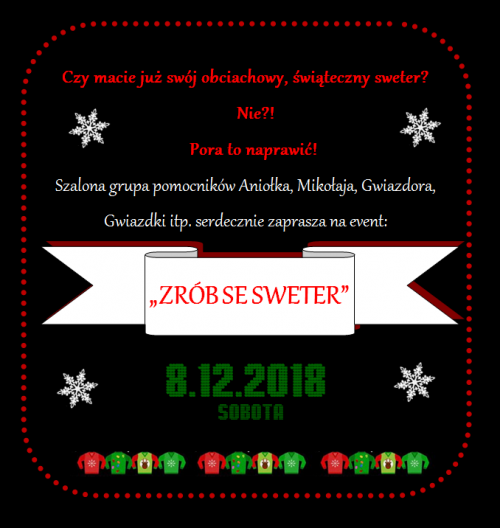 Wystarczy wpisać w popularnej wyszukiwarce „christmas sweater diy” i już macie podpowiedź! Po przyozdobieniu swetrów zrobimy sobie wspólne zdjęcie. Będzie czekała na Was także niespodzianka. Każdy z Was będzie mógł się poczuć jak prawdziwa gwiazda. Each participant brings an ordinary sweater, a few decorations to decorate and materials (eg needle and thread, glue). The sweater does not have to be new. You can buy it in the second hand even for 1 PLN! It is important that it matches the participant who will make it. It depends on your imagination. They can be sequins, buttons, strings, old baubles, iron-on transfers, Christmas chains, lamps, bells, pieces of materials, etc. ... we do not accept them (although as provided for in the regulations, this is an optional task). Each of you has an idea for a sweater. Just enter to the popular search website "Christmas sweater diy" and you will have a hint! After decorating the sweaters, we'll take a picture together. There will also be a surprise waiting for you. Each of you will be able to feel like a real star. Several people in Poland agreed to make a similar event in their city. After the publication of other events, we will add a list to be up to date! We hope that this mini Christmas competition will motivate you to creative action and will encourage you to come to the meeting. In Opole event will be in English to integrate foreign-speaking residents of our city in this special Christmas task together. OPOLE – WHERE? AND WHEN?